When spring is just barely in the air yet you're positively aching to pull out your pastel blazers, lace tanks, and floral mini skirts, I come bearing some good and some maybe not-so-good news for you! Bad news first: although you may be feeling antsy (I know I am), it's not springtime yet so unfortunately it would appear a bit premature to be spotted in full-on May getup (I'm talking your new Steve Madden sandals, those adorable paisley shorts your just bought, a mint cardi, and your trusty white skirt sans tights). However (and this is the good news), those fun springy pieces can be worn (yes, even now), just not all together. Pick one key piece and keep the rest of your ensemble more neutral and seasonal appropriate. 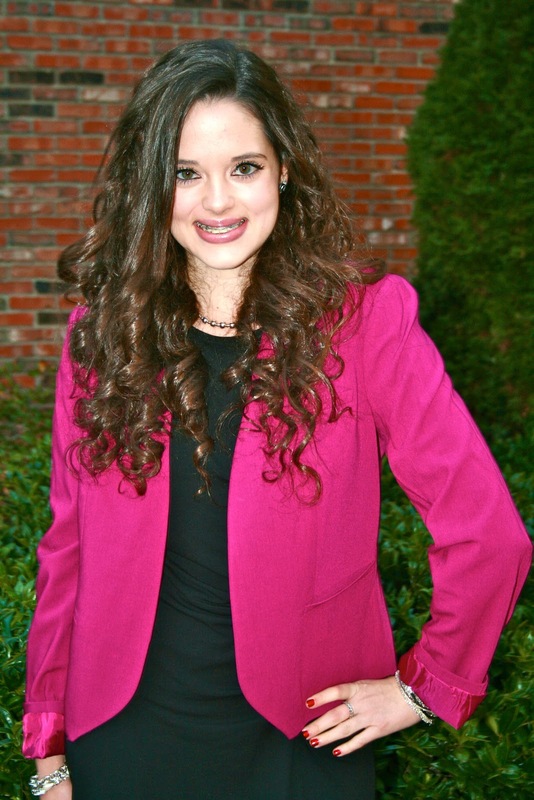 I was dying to wear my pink blazer in order to add some springtime flavor to my look and with that, a little pep in my step (because who doesn't like a bright and cheerful blazer)? But at the same time I didn't want to appear to be jumping the fashion gun and rushing into springtime trends so soon after daylight savings. So, I found my happy medium and was able to compromise with lace tights, a black dress, and my fun blazer. Win win! This is a professional look with a pop of that springtime goodness we're all craving! 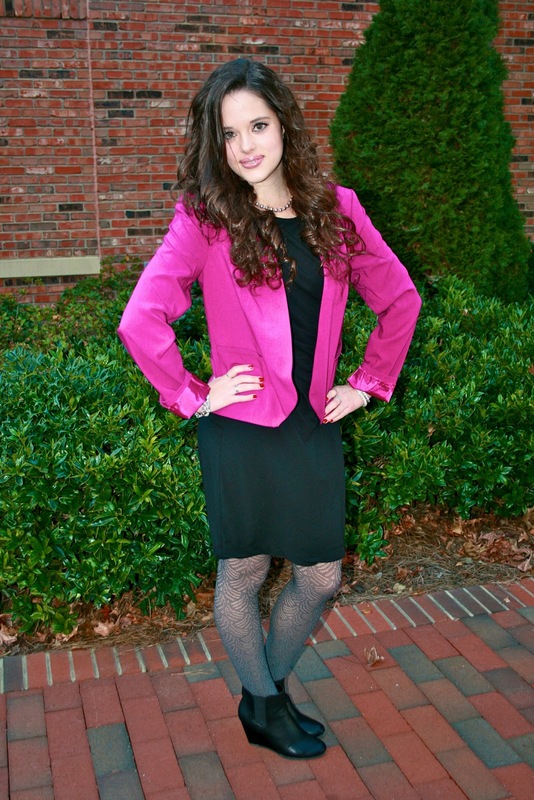 The blazer adds such a happy color to the outfit and your tights look so much fun. I love the fab smile and the hair. lovely blazer! it creates great contrast! Love your blazer <3 Great outfit!! You look great in pink, did you know that??? BTW, love the curls, hot hot hot! Stunning! 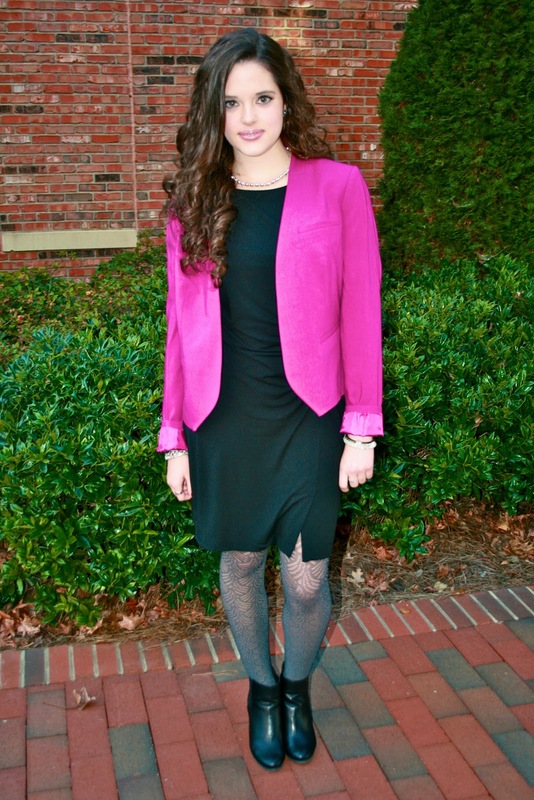 love the contrast of bold fuchsia against the plain all-black ensemble! As I said in my previous comments - this color is perfect for you. You look amazing with your bright colored jacket! Love it! Fuschia to welcome SPRING! <3 Color blazers are trendy! That hot pink blazer is SO cute! love black + pink !!! excellent post! Very beautiful color of jacket! amazing blazer - i like the color! Cute look. Love your tights! Cute jacket, love the colour! Im with you, I'm dying for spring clothes!i like the pop of pink to brighten this outfit up and your hair is gorgeous! 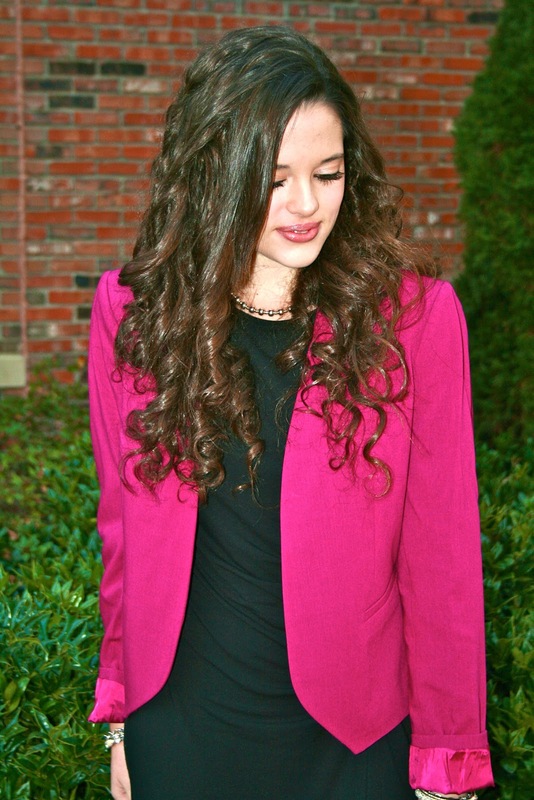 Great outfit with the pink blazer!! Thanks for stopping by! I'm now following you back! Keep in touch!! Love the tights and the bold blazer. Your pink jacket is so beautiful! Ciao... I'm following you back now!!! Love the blazer and dress! nice dress...the blazer looks beautiful and i also love the colour !! This pink is one of my fave spring colors ;) So pretty! 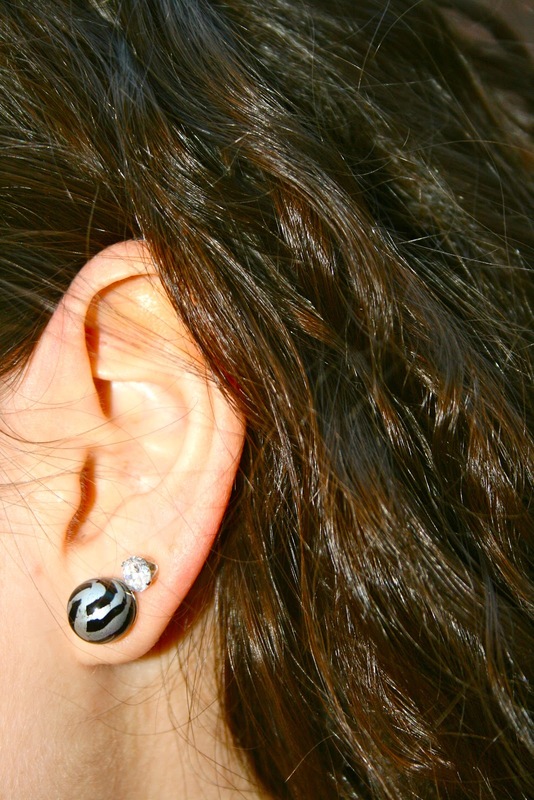 You have a really an exemptional style! Nice blog, i'm new follower, do you follow me too?? 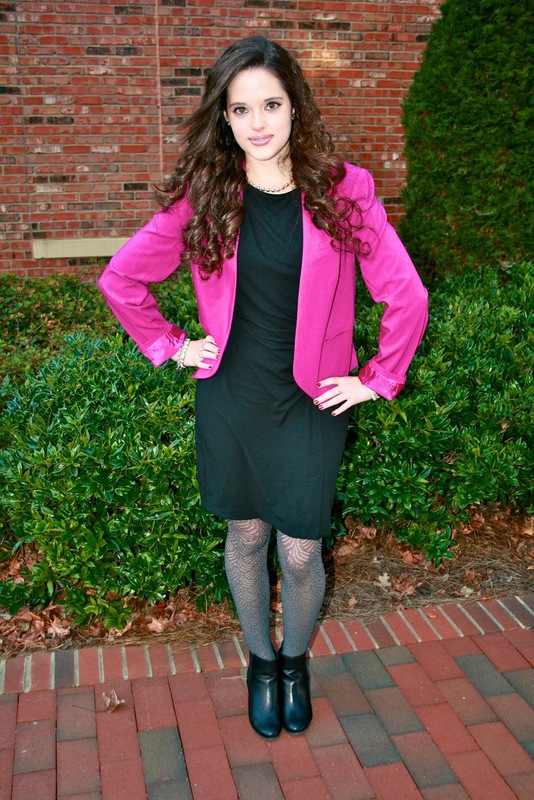 That pink blazer is so much fun! Your lips are really pretty! You are shining. I love the jacket. Your jacket is perfect for spring! Love the color! You have beautiful hair, I love the shape of the curls! 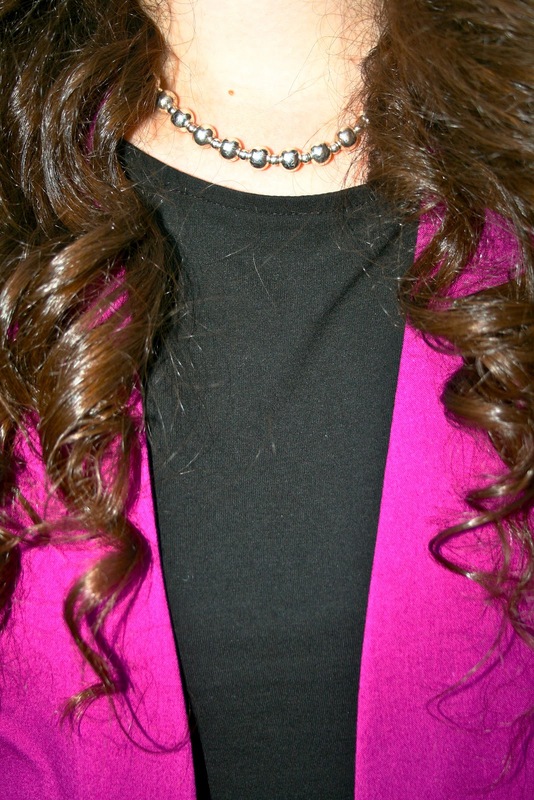 I need a hot pink jacket in my closet, its perfect for spring! You look lovely! Love your blazer! I think we both had the same spring idea to wear pink! 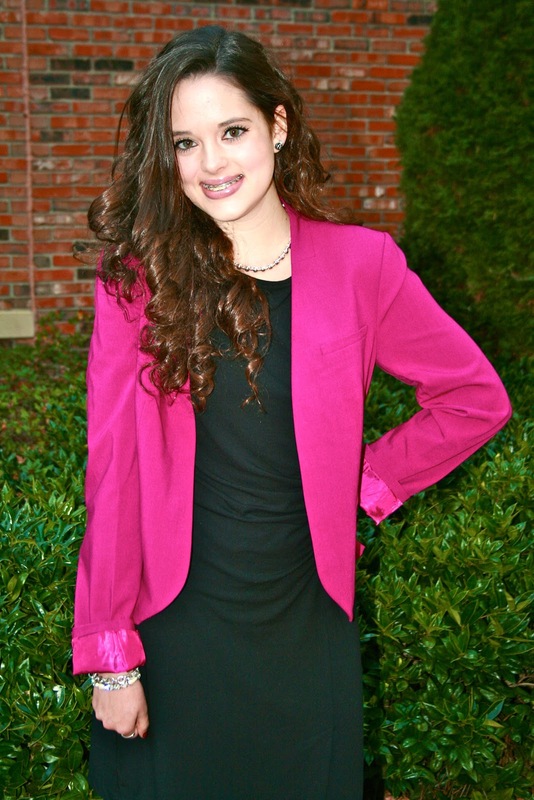 :) That is such a beautiful blazer and perfect for the transition to spring! Love your lace tights, they add so funmuch to the outfit! Hope spring comes soon! your blog is amazing!! like the pink blazer! good contrast to the black dress. so pretty! 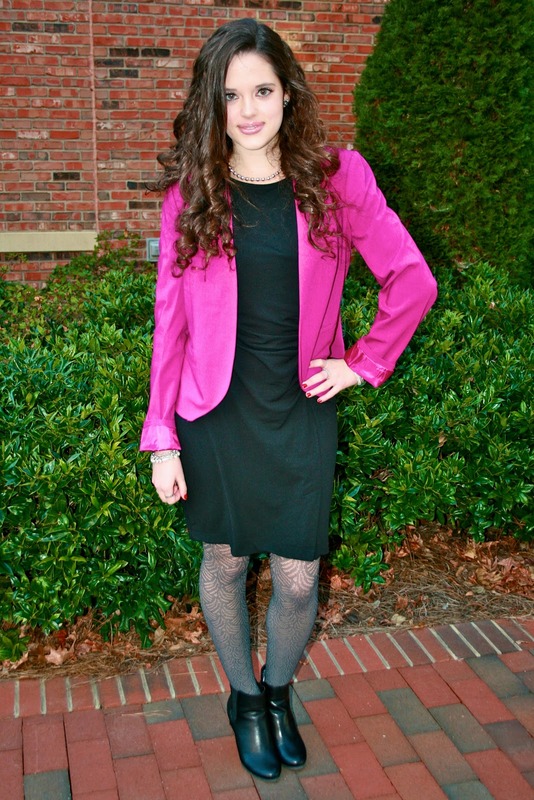 love the pop of color with your blazer! Love your blazer! The color is just perfect! Hi Kat! What a fun outfit!! Love the hotpink on black, and those tights are so cute too :) You always look great in anything that you wear, thanks for sharing! Pretty in pink! Love that blazer girl:)! Perfect color on you!